Urban forestry’s next era focusing on integrating different disciplines. 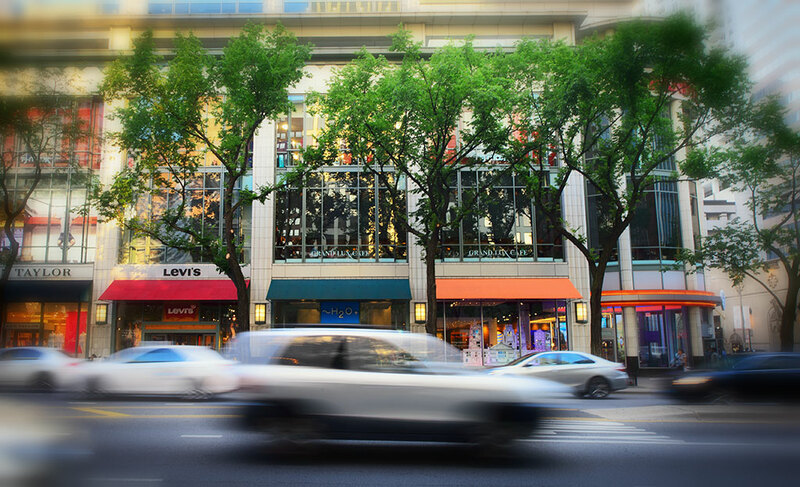 Trees can reduce crime, speed up recovery time and improve perceptions of business districts. Credit: Chuck Fazio, our Artist-in-Residence. The idea of actively managing trees in cities and towns goes back to some of the world’s oldest civilizations; ancient Egyptians, Greeks, Persians, Chinese, Japanese and Romans all invested in green spaces within the expanses of their bustling cities. They created groves around their places of worship and planted trees around buildings, each in their own way recognizing the inherent value of engaging with nature, not just on great excursions but on a daily basis. By the 19th century, as modern cities began to take shape, this tradition continued. Paris became defined by its tree-lined streets. The much younger United States, still grappling with its relationship to an untamed wilderness frontier, perceived forests as a threat and hindrance more than an asset. The only value many thought trees had was in planting them as a reminder of their homeland. Not surprisingly, many invasive species were introduced during this period. There were, however, exceptions. Famed landscape architect Frederick Law Olmstead forged a green aesthetic for numerous college campuses, the National Zoo and parks. Most famously, he was part of a visionary team of city leaders and activists who saw the need for green space for working-class residents in a still relatively small, but rapidly developing, New York City. Even as farms could still be found in the middle of Manhattan, Olmstead created a landscape design which resulted in an 800-acre urban park, Central Park, whose value would only be fully realized decades later. Levison was voicing a growing need for national leadership on urban tree care, and American Forests responded by expanding its conservation scope to include urban areas in addition to its historical wildlands-focused work, which protected wildlife habitat and provided water and timber to the centers of commerce and expanding populations that demanded use of that water and timber. American Forests in that era helped forge the modern standards of arboriculture and later created jobs planting trees through the Civilian Conservation Corps, giving people dignified employment and stability through the Great Depression. As a precursor to modern day urban tree canopy assessments, American Forests also supported a national inventory of the country’s urban elm trees, anticipating the threat of Dutch elm disease that was affecting Europe in the 1930s. By the mid-20th century, it was clear that the management of individual green spaces and individual trees needed to evolve further. A more science-based, comprehensive approach to managing tree canopy in and around cities was needed. Not coincidentally, the term “urban forestry” was coined in 1965, at the University of Toronto. This more sophisticated effort to study and manage, as a cohesive ecosystem, the natural resources of even the most intensely built environments, needed a national convener and voice. American Forests once again stepped into that role, organizing a first-of-its-kind National Urban Forestry Conference in 1978, and helping to forge and implement a vision that would become, in the 1990 Farm Bill, the U. S. Forest Service’s Urban and Community Forestry Program, which remains dedicated to addressing the unique needs of tree canopy in urban landscapes. Parks and tree-lined sidewalks promote physical activity and public health. Credit: Yinghai Lu. In the ensuing 34 years, urban forestry has grown into a robust, sophisticated field. World-renowned scientists from the U.S. Forest Service urban field stations and other federal and state agencies, universities and private companies use leading-edge technologies and techniques, growing our understanding of the impacts of trees, and often specific species, on water and air quality, economic viability and human health. Human health and economic research, in particular, have changed people’s perspectives of the role trees can play in urban environments. From studies showing impacts on crime, domestic violence, ADHD symptoms, cultural isolation, neighborhood stability, student grades and even birth weight, trees are proving their worth in urban landscapes in many ways. 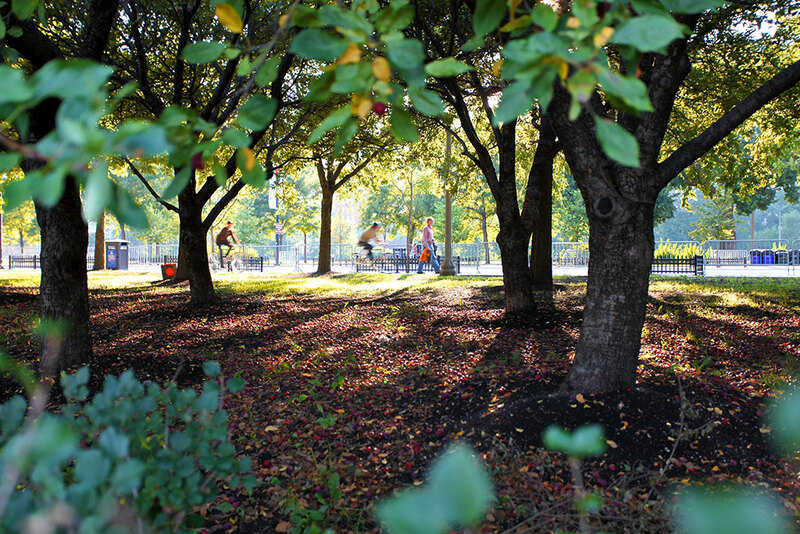 We recognize that urban forests are not a panacea for our many complex urban challenges. When addressing stormwater management and air quality, or crime and cultural isolation, there are many considerations, both technical and socioeconomic. But, when urban forests are designed and managed properly as part of the solution, there is strong scientific and experiential evidence showing that they can be a significant contribution. To that end, in disciplines as diverse as education, healthcare, city planning and transportation, there is newfound interest in better understanding how to harness the urban forest to address their different needs. Yet, in spite of the advances, these voices are often isolated within their own fields. Restoring urban forests is not a strategy included at the decision-making table often enough because the research and technical knowledge of how urban forests function and their benefits is not yet fully incorporated into how built-environments are designed. A coalition of national urban forestry organizations came together 10 years ago to figure out how to better work together to advance a unified urban forest agenda for our nation’s communities. Named the Sustainable Urban Forests Coalition (SUFC), this network has solidified that foundation and become, in recent years, a space to engage diverse disciplines, including city planners, educators, landscape architects, nonprofit leaders, scientists, arborists, foresters, nursery managers and many other professionals who care for, monitor and advocate for trees and our urban forests as a whole. With a strong and enthusiastic membership, the coalition is working to expand even further the diversity of disciplines that are represented. Urban forestry is a platform that addresses numerous concerns, it’s not a single issue. Urban forestry is a successful topic, applicable to any issue of interest to community advocates. Bring urban forestry to people rather than expecting people to come to urban forestry. This seemingly subtle shift represents an evolution of thinking about our field, from the 1980s when Rexford Resler spoke of bringing the American public to the concept of urban forestry. It is clear today that a more effective approach lies in bringing urban forestry as a platform to other disciplines to incorporate into their overall objectives. 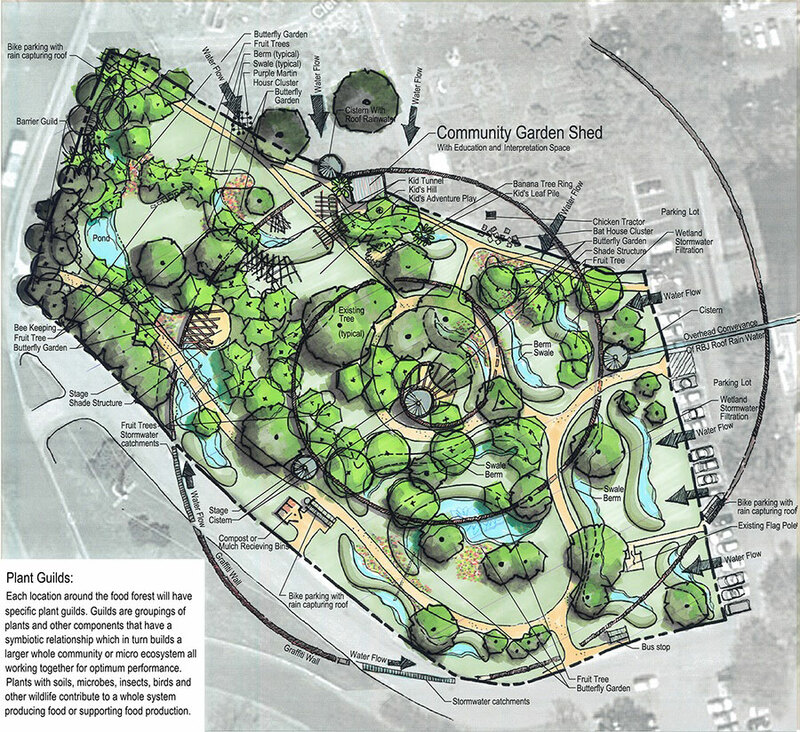 Site plan for an urban food forest project in Austin. Credit: American Forests. One of the outcomes of the Urban and Community Forestry Program authorization in the 1990 Farm Bill was the creation of the National Urban and Community Forestry Advisory Council (NUCFAC). This group of appointed advisors to the Secretary of Agriculture is responsible for synthesizing into a consistent vision the full spectrum of views on urban forestry, as a foundation for practical policy. Just this year, NUCFAC released a “Ten-Year Urban Forestry Action Plan” that was developed by, and for, the urban forestry community to guide its efforts for the next decade. Building on those Vibrant Cities lessons, the goals of this Action Plan feature engagement with other disciplines as fundamental to urban forestry work going forward: integrating with all scales of urban planning and human health, diversifying funding sources by collaborating with other disciplines and harnessing the next generation of technology. Taken together, these elements make it clear that the field of urban forestry is ready for its third transformational evolution: from individual tree care in the early-20th century to comprehensive urban ecosystem management in the mid-20th century to now fully integrating with other disciplines in the 21st century. Once again, there is need for a national voice and convener to lead this integration. Once again, American Forests is stepping into that role, working closely with partners to build the infrastructural and organizational capacity that can bring the technical knowledge of urban forestry as a platform to diverse disciplines, such as those focused on housing, labor, transportation, public health and energy. The first step in this process is building online capacity. In partnership with The U.S. Forest Service’s National Urban Technology and Science Delivery Team, American Forests is developing a new co-branded website. 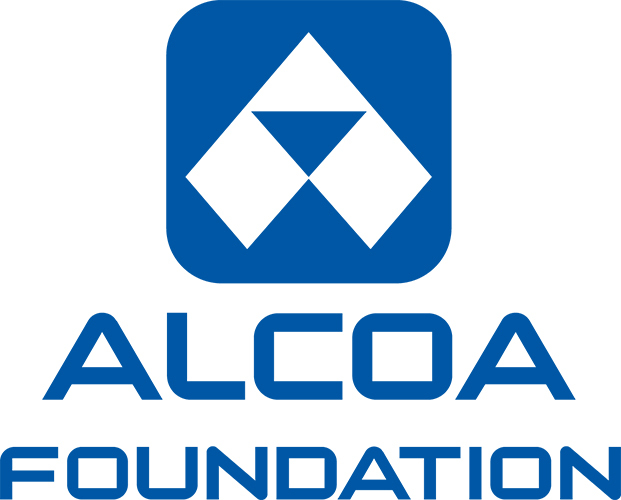 This platform will synthesize leading research, present best practices and spotlight innovative projects focused on an array of topics, including human health, education, economic impact and workforce development, water and sewer management, transportation, social equity, urban waste utilization, public safety, city planning and smart cities technology. The goal is to make it easy for mayors, city managers and professionals who are grappling with complex issues to learn how urban forests can be part of the solution. As this online resource drives curated content to targeted audiences, we seek to build a cross-disciplinary community that can deliver our field’s vast body of research, technical knowledge and practitioner experience to inform decision-making processes that impact urban livability across the country. As part of that effort, American Forests, through its ongoing support in cities around the country, will pilot innovative greening projects that put these ideas into practice. If successful, when it comes time to do the next “Ten-Year Urban Forestry Action Plan,” we will find the informed integration of tree canopy and healthy green space embedded in the decision-making process and funding allocation for an array of disciplines that may appear, at first, to have nothing to do with trees. We will find police unions and school districts, stormwater and transportation managers, as well as mayors responsible for it all, seeing tree canopy from different perspectives, but seeing tree canopy nonetheless. Ian Leahy writes from Washington, D.C. and is American Forests’ director of urban forest programs.